Consider this photograph, taken when I was on holiday in Jasper National Park three years ago with my family. I’m quite proud of it. It’s a beautiful view, if I do say so myself. The way the trees and the mountains frame the island, the richness of the colours of the water and the plant life, the starkness of the lighting because of the storm clouds, the stillness of the water… Only I could have taken this photograph, right? It’s a big lake. There has to be thousands of possible shots for tourists to take, right? The Camera Products Co (Publisher) . The narrows, Maligne Lake, Jasper National Park, Alberta. Vancouver: Published by The Camera Products Co., 1731 Dunbar Street, Vancouver, B.C, [ca. 1940]. Courtesy of Peel’s Prairie Provinces. Nope. I’d wager that many people who have visited Maligne Lake have taken a photograph almost precisely like this one, at least in terms of composition. 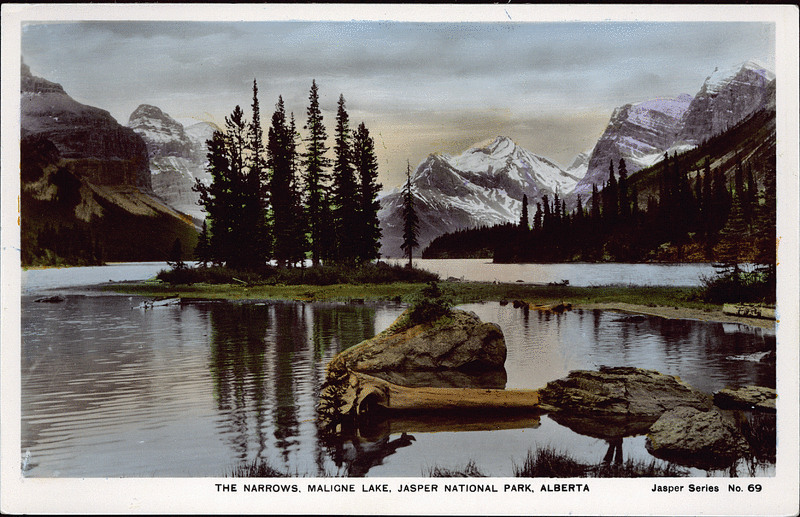 Do a quick Google Image Search, keywords “Maligne Lake.” Fully half, if not more, of the photographs are narrow variations on the theme of this small island. And this isn’t anything new. Maybe the photographs are in black and white, or are coloured by hand. Perhaps the resolution changes with the settings and/or quality of the camera, or there is more or less snow or greenery depending on the season. Maybe the trees on the island have grown, or there is a different log floating in the foreground. There are slight changes in angle based on the photographer’s height, or perhaps it is framed slightly differently according to the photographer’s eye for the scene. Nevertheless, in composition and choice of subject there is a striking consistency in shots taken at Maligne Lake. If you further refine your Google image search to “Maligne Lake Spirit Island”, the similarities in composition are even more narrow. Weiss J.A (Photographer) . 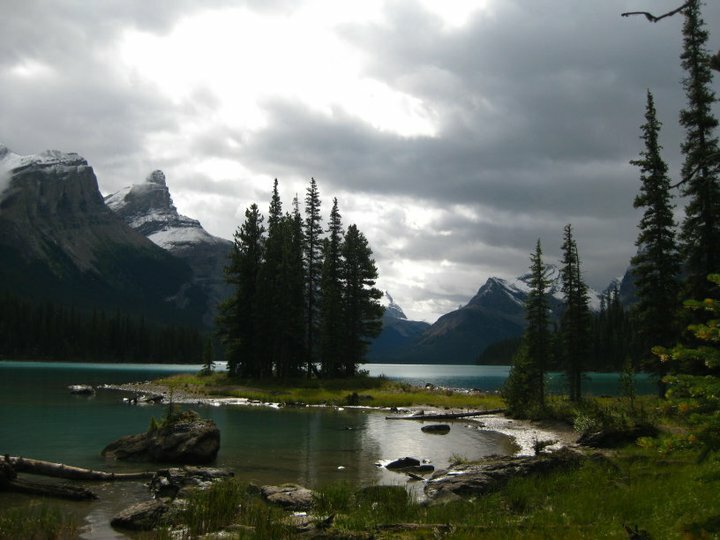 Maligne Lake, Jasper Park. Jasper National Park: Photographed and Copyrighted by J.A. 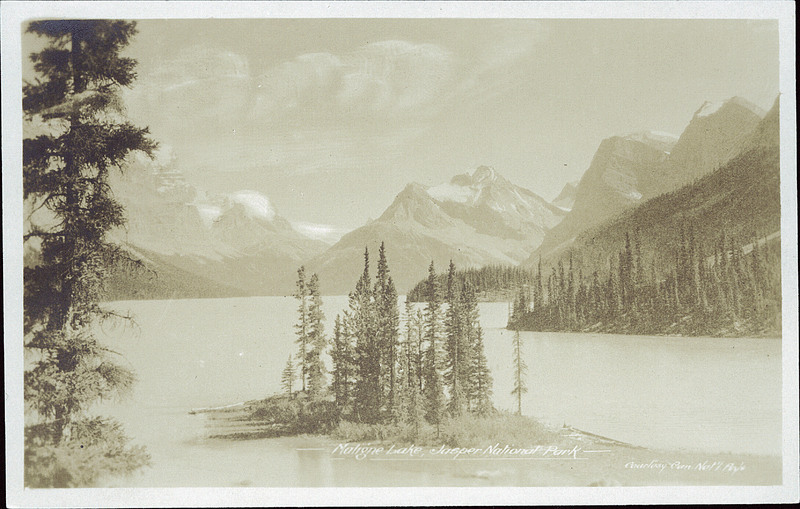 Weiss, Jasper National Park, Canada, [after 1930]. Courtesy of Peel’s Prairie Provinces (click image for link). Why is this the case? Is this the photograph that Jasper’s tourism industry “wants” you to take? Historian David E. Nye, in “Visualizing Eternity: Photographic Constructions of the Grand Canyon”, speaks to the initial difficultly Americans had in attracting tourists to the Grand Canyon. Put simply, it was too big. Ironic, I suppose, because that’s its biggest draw, today. When you imagine the Grand Canyon, you picture “bigness” in your head. But unless it’s the new “Skywalk”, do you “picture” any particular aspect of the Grand Canyon? Since the nineteenth century – well, since the popular rise of tourism period – tourism and photography have been intrinsically linked. It’s a cliché; tourists are inseparable from their cameras. They seek out the most photogenic things for the express purpose of capturing their image. The search for the perfect shot becomes bound up in the touristic experience. So much of touristic sites are viewed through the camera lens. What sites become havens for tourists are often determined by how pleasingly they can be photographed. But what of the things that can’t be photographed? You can’t fit the entirety of the Grand Canyon into one frame, or even a panoramic shot. Nye argues that that is one of the reasons why the Grand Canyon was so slow to become popular: because it was difficult to photograph. The best shots that showed the most depth could only be taken from the bottom of the canyon, where very few tourists visited. Some early photographers tried to treat the canyon as sort of the reverse of the more familiar mountain landscapes, with little success. What do you train your photographic gaze upon, when the subject of your gaze is so gigantic? The photograph needs a focus, particularly something that is unique to the region, if your goal is to attract tourists there and not elsewhere. In the case of other national parks, it could be a geyser or a waterfall… or an island. 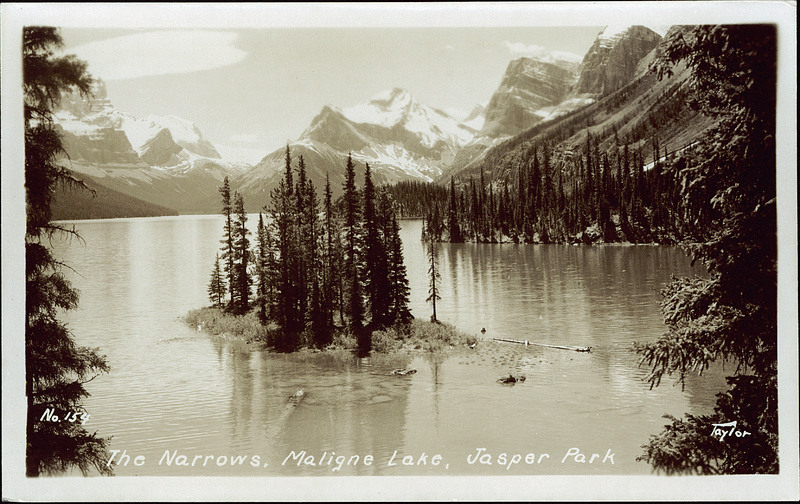 I think that that’s what’s happening in these photographs of Maligne Lake. The mountain landscape is gorgeous, but a bit too big to comfortably fit into one frame. Or, if you do take a photograph of the mountains, there’s nothing strikingly unique about it. Spirit Island functions as a wonderful focus, and a symbol for this lake in particular. The landscape surrounding it, by contrast, isn’t atypical of the many other dozens of lakes in the region. Spirit Island and the eye-pleasing composition found there is an identifiable image and symbol of the region. Hence, its appearance on hundreds of postcards and in innumerable tourist scrapbooks. Gowen Sutton Co. Ltd (Publisher) . Maligne Lake, Jasper National Park. Vancouver: Published by the Gowen Sutton Co. Ltd., Vancouver, B.C, [after 1921]. Courtesy of Peel’s Prairie Provinces. Spirit Island on Maligne Lake resides in Jasper National Park, which is protected by the Canadian government as a preserve of the natural bounty of the Canadian nation. (Fewer people know of the First Nations who were removed from the “park” upon its creation in the early 20th century, to make sure that the land remained untouched and unused… unless you were a tourist.) Today, to get to Spirit Island, you must go by boat – you must buy a ticket, or theoretically rent a canoe, but it’s a long, long paddle over about 15 km of gorgeous landscape if you do. (Few seem to photograph the passage in between the dock and the island. Or, at the very least, they aren’t considered as striking as the ones of Spirit Island.) You are deposited on this island for about 20 minutes to take in “the view”. You would be a foolish tourist indeed to forget to bring your camera out to photograph this place. Why Spirit Island? Why not the mountains around it? Why not use Spirit Island as a platform to get out into the lake? Why not take photographs from the boat? Tourists have the option of moving about the dock or going through the trees… but many don’t seem to do so. Apparently, it has been determined over the years by consensus that this is one of the best views – the best of angles – to capture the spirit of Jasper. It fits neatly into your camera’s frame. It is uniquely identifiable as a place. Hence, its overwhelming representation on postcards of the region. Where could this photograph have possibly been taken?! I recognize nothing! Photograph by Lauren Markewicz. In case you haven’t guessed, this photograph was also taken at Spirit Island – it’s visible in the right of the frame. I had moved about five or ten metres to the left to take this shot. I believe it to also be a fine photograph. The mountains and the island dip down towards the centre of the frame, and the land also meets the water at precisely the middle of the shot. We can see the reflections of the mountains and the sky in the water. I like it, but it’s not a “postcard-worthy” shot. This photograph isn’t nearly as iconic as, well, the photograph of Spirit Island that’s on all of the postcards where the island appears front and centre. Oh, and as an ultimate sign of betrayal and false advertising: Spirit Island? It isn’t even an island most of the time, except when there’s spring melt-off. It’s a peninsula. I suppose “Spirit Peninsula” doesn’t have the same ring to it. Except in this case. Here, it’s an island. Taylor G. Morris (Photographer) . The Narrows, Maligne Lake, Jasper National Park. Jasper: Photographed and Copyrighted by G. Morris Taylor, Jasper National Park, Canada, [ca. 1940]. Courtesy of Peel’s Prairie Provinces. 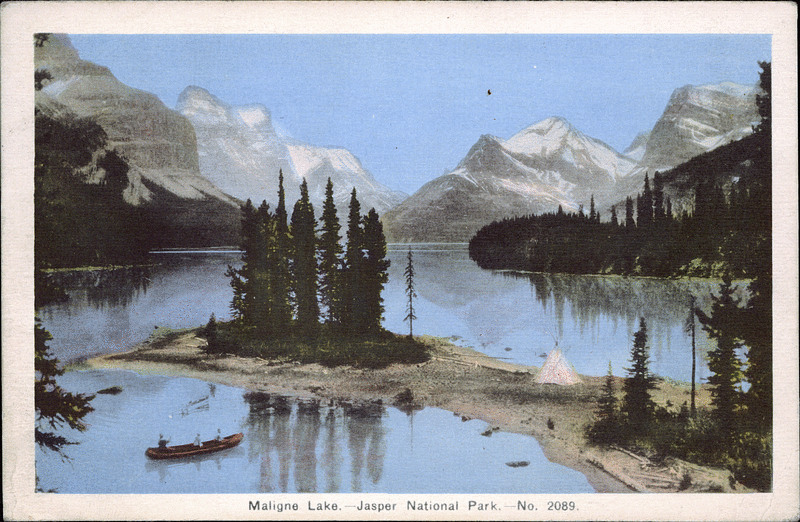 One more postcard for the road – this time, with bonus tipi and canoe. Photogelatine Engraving Co (Publisher) . 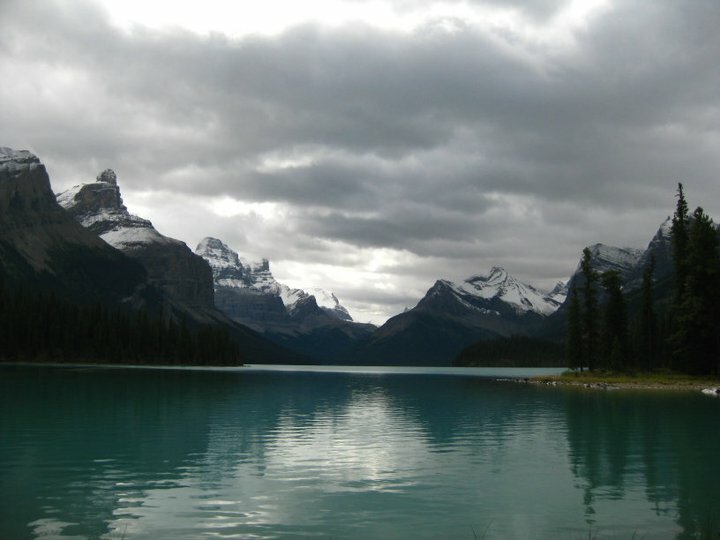 Maligne Lake. 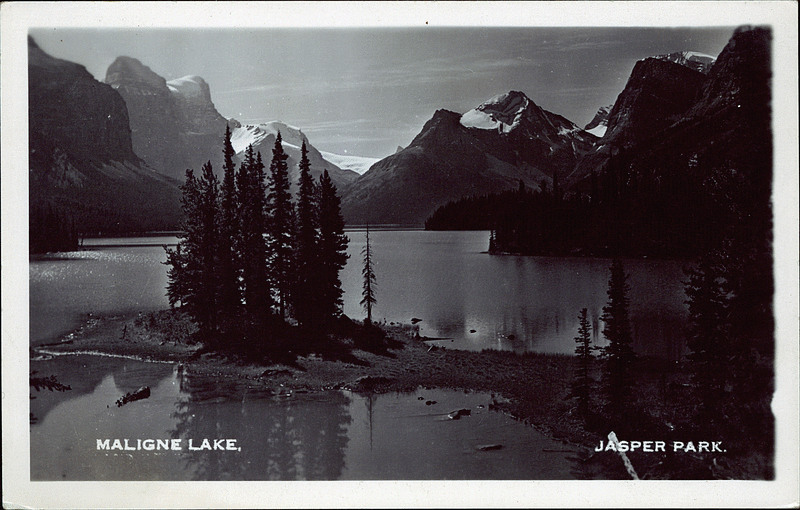 – Jasper National Park.. Ottawa: Photogelatine Engraving Co. Limited, Ottawa, c1942. Courtesy of Peel’s Prairie Provinces. Nye, David E. “Visualizing Eternity: Photographic Constructions of the Grand Canyon.” In Picturing Place: Photography and the Geographical Imagination. Edited by Joan M. Schwartz. London: I.B. Tauris: 2003. Peel’s Prairie Provinces Postcard Collection.